In september of this year, Twitter increased tweet charcater limit from the usual 140 charcater to double which is 280 characters, but it was only made available to celebrities and some other few Twitter users with large number of followers. Now, after testing the new character limit for about 2 months, Twitter has officially started rolling it out to all users globally. 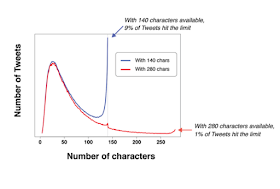 During the test period, Only 5% of tweets sent were longer than 140 characters while only 2% were over 190. Note that this data was collected before the limit was changed for the vast majority of Twitter users. The new 280 characters is not available for Japanese, Korean, and Chinese users because these languages has lesser characters in their languages. They'll continue to have a 140 character limit because it takes fewer characters in those languages to say something that would take many more characters to express in other languages. With this new character limit, users will have more room to express themselve in a single tweet. Those whose limits have been lifted will see a new circular character limit indicator, which replaces the digital counter. You can go ahead to update your Twitter app and/or login via their website.